My fellow Neil Gaiman fan in the office and I finally decided that we will go to the Neil Gaiman book signing event on March 18. This afternoon, we went to Fully Booked Store, the sponsor of the event, to buy 2000 pesos worth of Gaiman's tomes. This purchase gave me a pass to the book signing event. I picked up three books namely, Signal to Noise, The Graveyard Book and M Is for Magic. 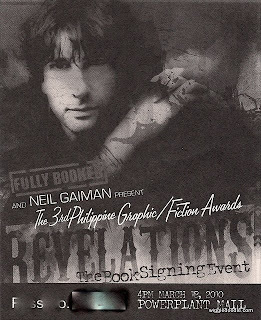 Unfortunately, Mr. Gaiman will only sign two books per pass holder and I have several books by him in my collection. I must decide before the appointed time arrives. Whoever said that life is full of tough choices was not lying. Since March 18 is a Thursday, my officemate and I could only wish that we will have an official business outside of the office that day, Unfortunately, we have to be at the event before 2 in the afternoon to register and get our number for the event. With only 17 days to go, we must really come up with a plan on how to go there.